A puncture wound is of course a wound that is caused by a direct puncture to the skin and often the below layers. For instance if you were to stab yourself with a pencil, to prick yourself on a pin, or to fall onto a fork (I could do this all day…) then the resultant wound would be a puncture. Such wounds will generally be straightforward and without complication allowing the body to heal them easily. However it is important to treat them correctly in order to help speed recovery and to avoid infection. If the object remains embedded in the skin then you will normally want to remove it. However if the wound is very deep and there is a chance that it is penetrating arteries or organs, or if the object is jagged and could potentially cause damage when removed, you should leave it in and see a healthcare professional immediately. Otherwise you should carefully remove the object by pulling it out directly, and using tweezers if necessary. Dab with a cloth or tissue until bleeding slows down. If you cannot get the object out, or if it partially remains embedded then you should see a doctor. If you stepped on a rusty nail or stabbed yourself with a rusty knife then infection can occur due to bacteria that may have been on the object. As such it is important to ensure that you wash the wound and apply an antibacterial cream. If you have not had your tetanus injection recently then this might need refreshing and you should contact your doctor. 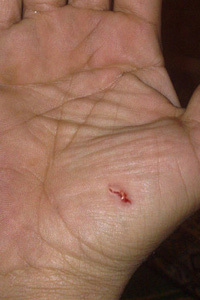 While the wound heals, continue to inspect for signs of an infection including redness or other discoloration around the area, swelling, puss or fever. After cleaning and disinfecting the wound you should use some tissue and a plaster to help stop the bleeding. You should remove the plaster and redress the wound on a daily basis using just a thin coating of ointment (too much can actually attract bacteria) and making sure to give your wounds a chance to get some fresh air in between. I just got stabbed by a rebound dart in the back of my left thigh. It hurts and I’m stressed out because they are touched by at least 10 people I know of. They’re home darts. They just lie on top of the book case and get picked up by. People playing. The dart stabbed me and fell out. Its red now, but it bled a tiny bit and looked blue at first. My leg hurts and feels like I’ve got a charlie horse. What should I do? I cleaned it and put topical clindamycin on it.